Sometimes hiring a signal integrity consultant means you want an engineer to queue up 100’s of simulations using one of the popular SI tools that automates that and then data mines the results. I don't perform this type of production analysis in my practice, nor do I build IBIS models. But, I’d be happy put you in touch with those who do. My approach tends to be more holistic, and I really drill into the details. I perform routing studies (wiring pitch and trace characteristics), analyze the effects of losses (skin effect, surface roughness and dielectric), perform stackup design and analysis (including laminate selection), will determine the proper termination and treeing for your specific design, analyze and show how to mitigate crosstalk, and design diff-pairs for you. You can contanct me here to learn more. 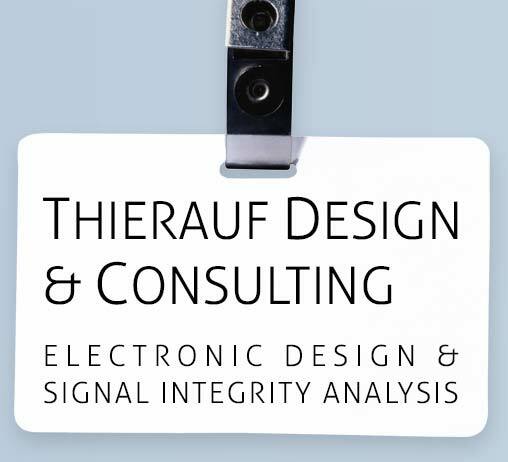 Do you need an expert set of eyes to review your RF, analog, digital or power supply circuit schematic or PCB artwork? I routinely perform schematic level and pre and post layout artwork design reviews for my clients in all of these areas. I use 2D and 3D field solvers along with SPICE, and can import Allegro, Altium Designer, PADs, KiCAD, PCB ARTIST and Eagle databases. Send me email to find out more. My hardware design services include circuit design, component selection and circuit board layout. I design from DC through UHF, including analog circuit design (opamps, instrumentation amps), analog sensor signal conditioning, power supply and power supply loads, embedded control hardware (PIC and ATMEL controllers), and serial signaling using LVDS, CAN, RS485. Startups and embedded systems firms (especially those without a strong hardware team) find my services particularly useful. Besides product development I deliver quick turn evaluation/proof of concept prototypes. This hardware is handy in demonstrating functionality at trade shows and to investors. Contact me here to discuss ways I can help you with your design. Do you have hardware needing to be debugged or validated, but you don’t have a lab with all the necessary equipment? Maybe you don’t have the time or the necessary hands on experience to perform debug or DVT efficiently? Do you want your board EMI prescreened, before you take it into the test chamber? I routinely debug and solve circuit board signal integrity, EMI, power integrity, timing and crosstalk type problems and perform DVT for startups and small firms developing embedded hardware. Send me your board. I’ll power it up in my lab where I make oscilloscope, spectrum analyzer and VNA measurements through 1GHz with the equipment I have on hand (I rent test equipment for higher frequency measurements, if needed). If you’d like, we can collaborate via Skype in real time as I poke and prod your board. Send me email and we can discuss how you can leverage my lab and debug experience to make your project a success.